I broke my arm, Erzulliestas. Yep. I broke my arm because I reached a bag wrong and ignored it for two weeks and kept on typing, writing and creating with my hands. Then came the day that I have noticed that it seems like it's not going away anytime soon, so I had it checked. Turns out I have an inflamed something in my arm and I have to undergo physical therapy. At first I was all cool about it. I mean, after all, there's a solution. I go to physical therapy and get my arm's strength back, but that Thursday morning? I will always remember. That day was my first day of physical therapy and before I went to the place, I was writing an article. My arm was hurting but I was used to just push on further. I like pushing myself beyond my limits. I think, for me, that's the only way to live --- to know until where I can take myself. Then, in the middle of it all, my left arm involuntary shook. My brain was commanding it to type in the words in my head but my left arm, like an abused being, was somewhat looking at me telling me, "boss... I can't do it anymore." I CRIED. I CRIED ON THE SPOT. I HAVE LOST CONTROL OF MY LEFT ARM. "I AM A WRITER. IF I CANNOT WRITE, THEN I DON'T KNOW WHO I AM ANYMORE." I called people. They comforted me, of course, but I was really scared still. I was afraid of losing my left arm forever and not being able to do what I was put here to do. Fast forward though, things got better and here I am slowly healing to a better level. So why did I share such a private story? Well, I know that there are a lot of Erzulliestas out there who are still figuring out who they are. To be honest, I have always known that I wanted to be writer --- but that's the point. I WANTED to be a writer --- I don't know if I AM ONE. It's like everyone wants to be a singer --- but are they really? You know what I mean? Then that moment when I cannot do it anymore, my soul cried. It finally told myself out loud who I am supposed to be and since then, I never looked back. 2016 striked again and gave me another life lesson before it ended. Many times in our lives we often wonder. If we are really meant for greatness, then how come we must always embrace some failures along the way? Why are we placed in the world to suffer sometimes and then be jubilant the next? I have realized it's because it's in the presence of absence do we start to really know who we are. It's only when we are stripped to our bones and down to our very core do we realize and find out our true being. In this case, when the ability to write was taken away from me (temporarily), I have realized what was really important to me. I am a writer. I am one. Always has. Always will. 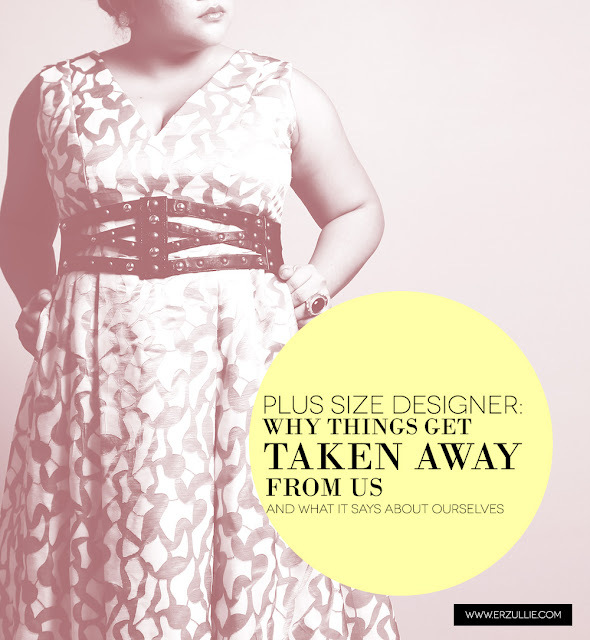 And as I gaze upon the thousands of blog posts that I have done for Erzullie and about plus size fashion (even fashion in general), I have realized that even if I didn't really "yell it out loud" to myself who I am --- deep inside, I knew. And with that in mind, I vowed never to take it for granted, ever again. And I know myself. This one? This one will stick. Just like the lesson about "how to be single while taken" and "how to love the life you're in".